It was a cold and windy day at the Central Texas State Veterans Cemetery, but that didn’t stop hundreds of volunteers from wrapping up a great year of Wreaths for Vets. 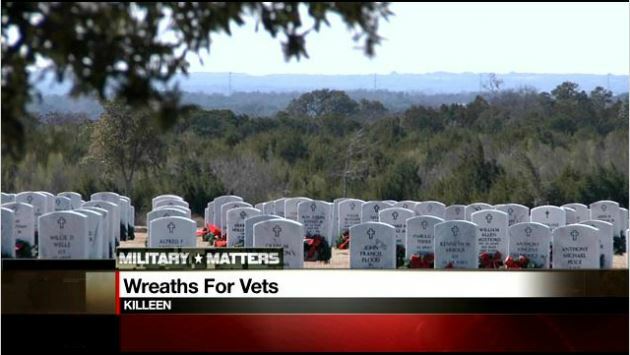 Thousands of wreaths covered the cemetery in Killeen throughout the holidays. Kim Dewald is one of the many people who volunteered each step of the way this year. People were in pairs…picking up wreaths, removing the bows and getting them back onto the truck. As volunteers collect the wreaths, they check each one to make sure it’s still in good enough condition to be used next year. Every wreath was collected in under an hour on Sunday because so many volunteers showed up. For some volunteers, the retrieval was their first Wreaths for Vets event.